I am a CrossFitter through and through and never thought I'd be advocating yoga. When we started offering it I attended because I liked the instructors--not because I liked or thought I needed yoga for any reason. After 2 months of doing our yoga classes consistently 3 times a week and then stopping abruptly for the holidays, I can honestly say I *need* yoga in my life. I went from constantly being plagued with aches and pains and chronic back pain to feeling on top of the world--not an exaggeration, I swear! I ended up with increased flexibility and stability in my joints and being able to go weeks without a chiropractor visit. Before, I could barely make it a few days. We all know we need more mobility in our lives but, like most of us, I'm busy and not disciplined enough to do the work on my own. Committing to attending every class we offered pushed me to do the work, but also taught me so much more about paying attention to my body and activating the right muscles at the right time than I already knew... and I own a gym so *I thought* I knew a lot. I didn't realize how beneficial the yoga had been until I took a month break over the holidays. My back started twinging again and I'm back at the chiropractor. Coach Laura’s first attempt at yoga. I implore all of you to try it... and not just once but commit to it for a specific length of time and see if you too can discover this magical unicorn sauce. I never thought I'd be the one advocating yoga, I never thought I'd be the one most anxious to have it back. If you were like me and never tried it, please reconsider. Not only are my chronic injuries improving but so is my CrossFit--things are easier, my weights are going up because my muscles are looser and activating properly--something I've never experienced. After years and years of being plateaued, I'm finally improving again as an athlete. Yoga is currently offered every Sunday at 11:15am and is included with a Jet City Unlimited monthly membership. Why do I need fitness goals? The Goal Door is ready for you! So we finished Level Method testing and you’re wondering what’s next? The answer, my friends, is it’s up to you. Level Method is designed to shine a light on the areas where improving will help you the most. It does this by anchoring your overall level to your lowest levels: meaning you can’t level up until you improve your worst areas. This can be infuriating, but it can also be motivating. You now know exactly what to work on in order to improve your overall fitness. How do you do that? By setting goals! Version 1: You show up consistently for those 8 weeks. You work hard and do the workouts. Version 2: You set a goal to level up 2 levels. You work really hard, consult your coaches about how to improve and put in a little extra time after class. You discover that a goal you set is totally within reach and you work hard to get there. At the end of the 8-weeks, you’ve leveled up. In the same amount of time Version 1 will certainly be more healthy and have improved. But will you know exactly what those improvements are? Or how you got there? Version 2, on the other hand, will have the satisfaction of being able to measure how far you’ve come (whether you met your goals or not), and might have leveled up! But either way you’ll proud of what you’ve accomplished because you were paying attention to the journey. Choose at least one realistic, shorter term goal and one you’re not quite sure you can do. Think about the long term: what do you think you can do, with consistent work, in 8 months? A year? What’s something you’re close to doing with a little work (and maybe some help from a coach)? We want you to achieve all of your goals - but we want you to push yourself too. You can do more than you think! Get creative! Goals can be whatever you want: nutrition, weights, movements, consistency! Maybe you want to work out 5 days per week for the rest of the year? Maybe you want a body weight clean? Or a hand stand push up? Maybe you want all of those things!? Once you’ve written your goal(s) on the board, it’s time to get to work. When are you going to work on that goal? Are you going to do pull up negatives after class? Create a chart to track how many days you work out in a week? If you’re not sure where to go from here, talk to us! We’re here to help (and this is pretty much our favorite thing to do). Here’s a bonus about setting fitness goals: it will help you outside of the gym! When you accomplish a goal you’ve set, when you do something amazing, it boosts your confidence. You start to wonder what other things you previously thought impossible you might accomplish. And that, Jet City, is where it gets awesome! That’s what we want to see you living every day! So let’s see those goals! Get them on the goal door, and then let’s get to work! And of course if you need help - let us know (it’s exactly what we’re here for!). Keep your coach informed about any injuries or issues - we need to know how you’re doing! Injuries are the worst. You’re just getting into your groove at the gym (or with running, or tennis, or badminton) and suddenly you're down for the count. Dealing with an injury can be painful (obviously), frustrating, and really discouraging. Often your first impulse is to stay home, rest, and pout - but I am here to tell you that is not the only option. Keeping your body moving in some way can help you deal with the mental impacts of injury - and maybe get you back to normal faster. Of course the very first thing you should do is see a medical professional (see item #1 below for more about that!). Once you’ve done that and you have a recovery plan, it’s time to look for ways to keep moving. There’s plenty of evidence to support the idea that maintaining exercise in some way will get you back on your feet faster and in better spirits. In fact, a recent study found that stopping regular exercise can “lead to increases in depressive symptoms after just three days**.” And once you get stuck to that couch, it can be really hard to get back up again. With a little bit of creativity you can find plenty of ways to keep your gym schedule while your body heals. The wonderful thing about CrossFit is that “constantly varied” leaves lots of room for different movements. Sprained ankle? Nothing wrong with those arms, how about bench press!? Sore elbow? Seems like you should still be be able to run around the block a few times. Start by isolating the injured area, and then work out from there - what things can you move or use that don’t impact the injury? There is always something you can do at the gym (Physical Therapy exercises, anyone? ), so don’t just assume there’s no hope and abandon ship. What should you do if you’re injured? Consult a professional! We can refer you to a trusted health care practitioner (we know a few!). Folks who know about physical therapy (PT), acupuncture, massage, and chiropractic care are all there waiting to help you get better (and in many cases, better than before your injury). Talk to your coach. We can’t stress this one enough. We need to know what’s going on with you. Also, we worry! Don’t just disappear from the gym for two weeks – send us an email and let us know what’s going on. Don’t just fade away into the couch waiting for your body to do it’s thing. You take ibuprofen and cold medicine, right? So why not do everything you can to support the healing process for injury too? Stretch, massage, mobility work - just keep moving! In December 2016 I herniated a disk in my back and was out for a few months. My initial reaction was panic, especially when told over and over again that I couldn’t do anything but walk for the next few months (by those medical professionals I saw… hint hint). I didn’t want to get out of practice going to the gym and knew it was important to keep moving - so I went to the gym to walk. Eventually those trips turned into a walk + PT exercises. Then they became heavily modified versions of the workout everyone else was doing. Slowly but surely I was able to get back to regular classes with scaled movements. By the time May rolled around not only was I back to doing what everyone else was - I was stronger and better than before. So take it from me, if the worst happens and you get an injury follow the steps above and then get creative. You know your body best and you’re all it’s got - so make sure you’re doing everything you can to keep it strong and healthy. Nutrition: You Don't Have to Go it Alone! My name is Whitney Wilson, and I’m proud to introduce myself as your new Jet City Nutrition Coach. I have partnered with Healthy Steps Nutrition to jump start this new adventure in my life. A lot of you know who I am as a coach and friend, but not necessarily as a nutrition coach. I want to take a minute and tell you about my background and why nutrition is important to me. Introducing Jet City’s new Nutrition Coach: Whitney! Since childhood I’ve been riddled with injuries and other illnesses that have kept me from achieving (in my mind) “peak fitness.” Body image was therefore something I struggled with, and still do. But I no longer strive to be perfect. Perfect is unrealistic. Plus, if you are “perfect” there’s no room for growth. So how did I go from fad diets to comfort with being imperfect? I had help: I worked with a nutritionist. Whitney in 2015, before CrossFit and working with a nutritionist. I’m not talking about diets either. I’m talking about behavioral patterns, the way we look at food, and maintaining a healthy, active lifestyle. Of course it’s hard at first, but the best thing about having a nutrition program at your gym is that you don’t have to do it alone. Changing behaviors or eating habits is hard, but having support makes it easier. I wouldn’t have been able to do it alone. I needed the motivation. I needed someone to tell me all the “wins” I was having when all I could see were the mistakes. So now I want to give back by being that support system for others who are in my shoes. Helping people and giving back is a passion of mine. And while I can’t “fix” everyone, I can be by their side and walk their journey with them and pay back some of that support and encouragement I’ve received. I can’t wait to work with you! Lifting Weights Over Age 50!? Absolutely! Coach Rich (and member Bob) competing in a 2016 CrossFit competition. Growing older can mean that some of the things you did when younger aren’t quite as possible anymore. When it comes to exercising, does that mean that certain fundamental movements, such as push-ups and sit-ups, are verboten? Are there certain types of exercises you should just never do again? According to a recent article* that was floating around the interwebs, the answer would seem to be yes. On the list of exercises that someone over 50 shouldn’t do were weighted squats, high-intensity interval training, pushups, and burpees (among others). The rationale was that once you’ve reached that magical age, you are no longer able to perform these actions without irreparable harm to life and limb. While the author’s concern for the elderly is admirable, is an outright ban on these actions justified? Frankly, no. While the article does note that if you have medical issues you shouldn’t do these activities, it’s far too broad and ill-defined. Unless you have injuries or certain medical issues that preclude you from certain actions, there is no reason a 50, 60, or 70-year-old can’t do these activities. The athletic needs of a young athlete and a senior athlete differ only by degree, not kind. Sure, an older person may not be able to lift as heavy as a 22-year-old college athlete, but a 50-year-old is just as capable of squatting with weight successfully and with the same benefits. Any person, no matter the age, without proper instruction has the potential to injure themselves. That’s why we make sure athletes are instructed on how to do each of these movements properly, and progressions are provided to anybody who isn't getting the components exactly right. But again, that goes for any exercise and anybody, regardless of age. Let’s take the deadlift for example: This movement is fundamental for healthy living; it's how we pick stuff off the ground. If you’ve given up deadlifting, you've essentially declared yourself physically incompetent. It doesn’t have to be 500 pounds and every vein in your forehead popping out to be effective. Everybody should be practicing deadlifts, in some form or another, modifying as necessary to accommodate for restrictions or injuries. Same with squats, even with weight. As with most anything in life, use common sense when progressing upward. Obviously, a person of any age should speak with a medical professional before beginning any strenuous exercise program. If you’ve been cleared to participate a good coach is going to instruct you on proper form and communicate with you as to your progress through each movement, monitoring and correcting your technique, and helping you make decisions on your progression. Screen Shot of the original article. *Editor’s Note: The original article was edited and no longer forbids these movements. We’re excited to see that so many people understand the benefits of lifting weights - at ANY age! So, you’ve started doing CrossFit and you’re a little scared. Congratulations, that’s exactly how you SHOULD feel. A little fear is good. It means you’re out of your comfort zone and have the potential to stretch your knowledge, skills, or talents, may be around people you don’t know, and may frankly seem a little odd. CrossFit encompasses a bit of all of that, with the added benefit that you’ll also get stronger, more confident, focused, and maybe even a little smarter. I know you’re already thinking that you’re only exercising to lose a few pounds. That’s what exercise is for. Yes, that is a part of it, but in my experience, that may end up being only a small part of what you can gain. CrossFit isn’t promising you anything, however. The impetus is really on you to make all these wonderful things happen. But you don’t have to start with a bubbling fountain of confidence. You will get that as you do what all successful people do: practice, fail, practice more, fail a few more times, then, suddenly, lift 3 pounds more than you did a week before, run up the stairs without looking like you just got doused with a bucket of water, or outlast your friends on a hike. To me the reality of CrossFit isn’t always what happens in the gym (though obviously that is important). It is the results you see in your real life. It will be different for everyone. The best example I can give is what happened to me. After I turned 43, my health suddenly started to cave in on me. First, an extra 50 pounds had somehow appeared on my body. In tandem with that, acid reflux had become so bad that I was having to sit up at night and sucking down Prilosec just to get through the day. The final straw was, following a doctor’s visit, I was prescribed to go onto a CPAP, one of those awful machines that blow air up your nose to help alleviate sleep apnea, a condition that causes your bed partner their own sleepless nights due to your chainsaw snoring and you the potential of several issues including heart disease, cancer, and a few other nasties. Suffice it to say, I was miserable. I had on several occasions in the past said I would dedicate myself to a regime of healthy living. But the realities of growing older and beginning to have health problems is what finally motivated me to begin. After a year of going to a “regular” gym with slight improvements, I was introduced to a new thing called CrossFit. Our fledgling group took over a corner of the gym and began learning the principles of what made CrossFit tick as well as sweating through a new workout style that was anything but routine. I was hooked. Eleven years later and I’m still thoroughly smitten with CrossFit, became a coach about 6 years ago, and continue to see results from working out. Not only have my health issues disappeared, but a fortunate side effect I didn’t expect was helping to alleviate my issues with depression and anxiety. While no one can guarantee that you will have these same results, we can guarantee that doing CrossFit---and learning more about living a healthier life---will pay off in the long run. As will introducing yourself to a community of dedicated people who are supportive, caring, and accepting of you and your goals. So be a little scared; it’s okay because that’s how you grow and improve! What kind of yoga should I try? In my 10 plus years of practicing yoga I have heard countless reasons as to why someone “can’t do yoga”. For most people its just something totally foreign and they don’t even know why they should try it in the first place. I’m going to skip right past the froo-froo-hippy-dippy stuff and break down the two different styles that will be offered at Jet City (hint: there are 2!). Want to learn more? Here is a great article that explains all 11. Starting the 2nd week of September, Jet City will offer Vinyasa and Restorative yoga! Read on to figure out which one is best for you - OR try them both! Do you like to move and work up a sweat? Then Vinyasa yoga is your jam. It is considered an aerobic workout without all the joint straining pounding of other cardio activities. It’s also a great compliment to the anaerobic workout of lifting weights. You’ll start off slow. Build on your breath and warm up the large muscles with slower movements (to prevent injury). Movements will become faster as you link “breath-to-movement”. This speeds up your heart rate, circulates synovial fluid in the moveable joints and removes toxins by sweating. The core is targeted specifically with abdominal floor exercises. This helps prepare the body for balancing postures. Some balancing posses will be on your feet and others on your hands/arms and even head. Balancing poses can focus on supportive muscle groups to help with joint stability. Most classes are built around a “peak posture” like Crow Pose or Bird of Paradise to challenge you to something fun and new. At the tail end of class you will hold longer restorative pose (I will get into that in a bit) like Half Pigeon and Supine Twist. These long deep holds help to break down the connective tissues and fascia. And last but not least, you’ll always finish with meditation and Corpse Pose…or just taking a 5 minute nap on your mat. Whether you just got done with a super intense CrossFit class or you just beat Seattle traffic to get to JetCity, restorative yoga will help you relax your body and your mind. As apposed to the Vinyasa style where you have many different poses and you are constantly moving, in a restorative class you spend longer time in less poses. So if you have a hard time with sitting still, you may get a little antsy in this class…but some would say that is exactly why you need to take it. Many classes will use towels and blocks to help prop your body into a pose so you are not straining to achieve the stretch. The less work you do, the better the pose will be for you. Sounds to good to be true! When you allow the body to slowly deepen into static stretching, it stimulates the deep layers of fascia that wrap around the bundles of muscle fibers. The breath is also important for a restorative yoga class. Slow deep breathing helps slow down the nervous system and lower your stress. Vinyasa yoga is a good full body aerobic workout that will strengthen your muscles, tendons and ligaments. Restorative yoga is a series of passive stretches that target the facia and connective tissues and help destress with deep breathing. Regardless of what class you take, just know we like to have fun and laugh. *I’m not a doctor but I play one on TV, so always consult with a medical professional before doing any new exercise or fitness routine. I was scrolling through Facebook recently and saw a video from a friend’s dance studio, which reminded me that I'd once taken a belly dancing class from her in the hopes that it would help me get into shape. I actually thought it was going to be my THING. I went for a couple months. I practiced at home, I had fun in the classes and I started to recognize people in class from week to week. But when my pass ran out I stopped going. Something about it didn’t stick. I took a Couch to 5K class from this awesome woman named Beth (twice!). For 6 weeks we went to Greenlake, rain or shine, and ran. By the time it was over I was running (slowly) around the lake and felt pretty great. Running was going to be my THING (and my path to getting in shape/ losing weight/ living my best life). After it was over I ran maybe two times a week, it was my only form of exercise for a while. I’d have to drag myself out of the house to get it done. Something about it didn’t stick. I went to yoga once a week, on Tuesday nights, for a while. I wasn’t super successful at it, but the great thing about yoga is that you don’t have to be. I went for a couple of months, and again started to recognize a few faces. It was going to be my THING. But I have back problems and got tired of trying to figure out on my own how to deal with poses that hurt, or what to do when my body just wouldn’t move a certain way. Eventually my pass ran out and I didn’t renew. Something about it just didn’t stick. I tried CrossFit once. It was hard and I had to modify every movement, but so did other people, so that was ok. I made it through the introductory program and kept going twice a week. I started to make friends at the gym. The coaches asked how I was doing and I never struggled to bring up anything that was sore or limiting - mostly because they always asked or proactively identified them - and then told me how to improve them. So I kept going - and it's now been 5 years. Something about it just stuck. What was it about CrossFit that made it stick when belly dancing, yoga, and running didn’t? Those other things have community aspects, they are approachable and fun. So what's the deal? I'm not just talking about making friends (though that's certainly part of it). I never had to figure things out on my own. There was always a coach there to notice if something was off, or push me to try something I didn’t think I could do. There was always someone there to welcome me, to ask how I was doing or where I’d been. So what was it that made Jet City CrossFit my THING? It’s the people. When I say CrossFit is about community I'm not just talking about the friends you’ll make (and you will). I'm talking about the built-in support system, about never having to figure out “fitness” on your own, about having a bunch of passionate people around to ask any question you can think of. You don’t have to figure out this health and fitness thing on your own. There are coaches waiting to help you and a community ready to support you along the way. And who knows, something about it might just stick. Hand health is extremely important to Crossfit athletes. Hand rips are a serious injury that can impact how an athlete performs for days or even weeks. Preventing hand and palm rips can be achieved fairly easily with the use of gymnastic grips. Gymnastic grips are typically a small strip of leather or other materials with finger holes that is attached to the wrist with a velcro strap. Designs can vary between brands, but overall most grips work to protect hands in a similar fashion. The following is a list of six of the more popular and well known gymnastic grips on the market today. All of these grips have been worn by local, regional, and games athletes in some capacity. Let us know if you've tried any of these - or if you have other favorites! Offer the largest variety of grips: 2, 3, 4 and no finger grips in leather and a synthetic material they call stealth. 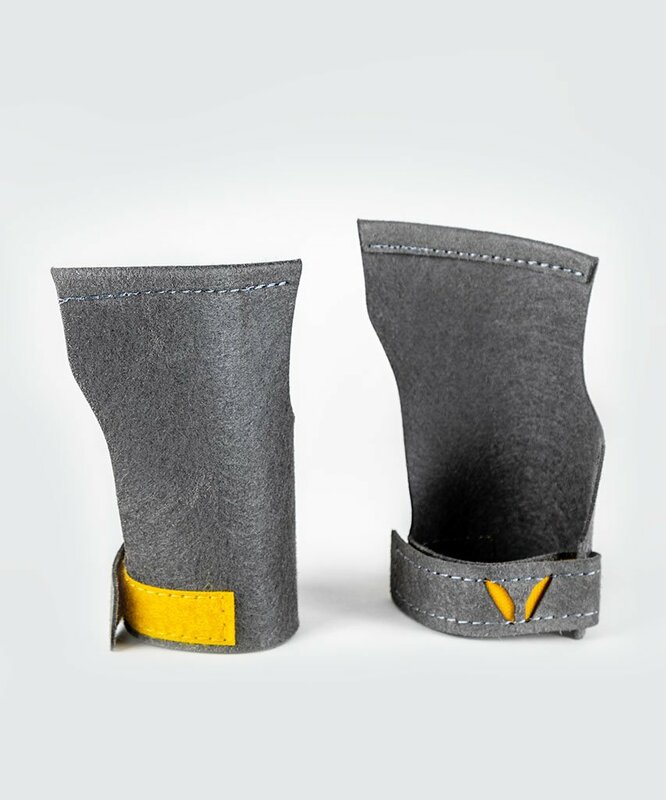 Their stealth material is the more intriguing material that they offer as it has a slightly better grip over a traditional leather grip and also does not stretch out like a leather grip would, making sizing a little easier to gauge. Victory grips run a little on the larger side to allow for the creation of a fold in the grip to secure the hand better on the bar. Victory grips also include a guard on the side of the hand for assistance with false grip for use with gymnastic rings. The Alec Smith grips are similar to the Victory Grip no finger grips. The exclusion of finger holes allows the athlete to go from gymnastic work to barbell cycling in mere moments. These grips include a small elastic grip to tuck the flap of the grips away. They also have added a padded strap which can double as a wrist support for varied metcons. Note that these are leather and will stretch out over time. Offer both 2 and 3 finger grips in leather and a special carbon fiber material. Their carbon fibers grips are designed to be used on slick bars and any other objects with less grip. Bear Komplex Grips include a contoured shape that is designed to stay on the palm through kipping pull-ups and toes-2-bar. Standard 2 finger leather grips. Similar design to many generic 2 finger grips. Nothing flashy about these, very basic but functional. Athletes should be advised to buy one size up for extra material to create a fold for better grip. Both grips are identical, so they do not fit both hands as well and the wrist strap can dig into the wrist. Tear resistant cloth grips. Very minimal grips that give very good bar feel. Can be reused but will break down faster than the other grips mentioned. More difficult to take on and off during a workout. Also must be secured around the wrist with tape or wrist wraps, no way to secure them by themselves. Least expensive option and good entry level grips. Woven elastic grips. Much less break in time than any of the leather or other synthetic grips. Attach to the wrist with a strap that can be used for wrist support. Wrist support is useful but cannot be removed for workouts where it is not needed. These give more bar feel but offer less protection. Are machine washable.